The argument could be made that the best non-fiction acts as a funnel, winnowing down into an expertly pieced mosaic the information the sources about the subject present. And the quality of the finished work is, of course, a direct reflection of the quality of the sources. The bibliography of a well-researched book is a work of art in and of itself, acting as both a road map to the finished book and a treasure map to a voracious reader. Consider the case of Swamp Water, Hollywood Enigma by Carl Rollyson, and Vereen Bell. One of the best sections of Hollywood Enigma, Rollyson’s biography of actor Dana Andrews, covers the 1941 film Swamp Water. It’s an obscure film despite its pedigree as one of the first American films by renowned French director Jean Renoir. I’d never even heard of the film, nor did I know that the source for the movie was a novel by an all-but forgotten author, Vereen Bell. Bell, a Georgia native, began his career writing for religious and juvenile magazines. He worked briefly as an editor of American Boy/Youth’s Companion before returning to Georgia to try his hand at freelancing. During the late 1930s, he sold outdoor stories to Collier’s and the Saturday Evening Post, and wrote two novels, Swamp Water and Two of a Kind, that first appeared as serials in the Post. Swamp Water, the story of a boy and his prized hunting dog finding trouble in the Okefenokee swamp, was published as a novel in 1940 by Little, Brown. The book was an instant success — a second print run was ordered a month after the first. According to the Georgia Encyclopedia, Bell sold the movie rights to Twentieth Century-Fox for $15,000, which is where the story gets even more interesting. A quick turnaround for a purchased property like Swamp Water was not unheard of during the studio era of film-making, but Swamp Water might have set a new standard for speed. The film was in theaters by 1941, no mean feat when one discovers, as I did via Hollywood Enigma, that the movie was filmed on location in Waycross, Georgia. 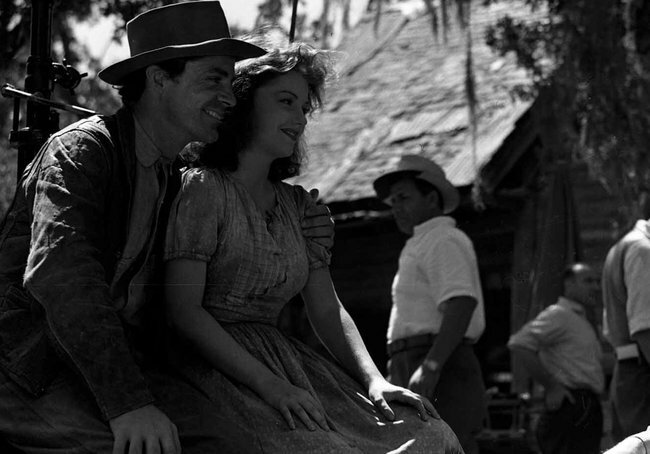 Renoir, new to Hollywood and riding on his reputation as one of French cinema’s best-known directors, insisted that a portion of the film be shot in the Okefenokee. In June, 1941, Renoir, along with Dana Andrews who played young Ben, the dog who played Trouble (and his trainer), and a small crew, descended upon Waycross for filming. Locals appeared in the film as doubles for male characters, and the Okefenokee played itself. After the Hollywood crowd left, Waycross residents began to campaign to host the movie’s premiere. They besieged Twentieth Century Fox executives with requests, and even sent Darryl Zanuck and others live baby alligators with tags affixed to their necks saying, “Even the gators in Okefenokee went to the premiere in Waycross.” Zanuck gave in and notified Lamar Swift, manager of the two movie theaters in Waycross—the Ritz and the Lyric—that he could have the premiere, slated for October 23, 1941. Georgia governor Eugene Talmadge declared the day of the premiere “Swamp Water Day” in the state, and Waycross merchants decorated the streets and their stores. A parade, special dinner, and wagon-ride preceded the premiere. Vereen Bell was the guest of honor. What I sought, in seeking all this information about Swamp Water, was more information about Bell. As someone with a degree in English with a concentration on early 20th-century Southern American literature, I was embarrassed that I had to learn of Bell’s work — and the peculiar history of Swamp Water — in a biography of a film star. Bell’s relative obscurity, however, may have less to do with popular neglect than with tragic circumstance. He wrote one more novel after Swamp Water before enlisting in the Navy at the outset of World War 11. In 1944, at the age of 33, he perished at the Battle of Leyte Gulf. But my discovery of Bell is the beauty of a great bibliography. The best bibliographies demonstrate an author’s struggle to understand his subject, to make sense of the subject in terms of both the immediate and as a part of a larger whole. As he struggles, he casts wider and wider nets around the subject, nets that may drag in seemingly unrelated, but important information. Even when the subject itself seems shallow, the sources that make up the finished product may have delved deeply into aspects that are not readily apparent. Nowhere is that more true than in non-fiction about American film and film stars; movies were so pervasive in the culture and sociology of the first half of the 20th century that almost any well-researched book on the subject unearths a wealth of diverse, fascinating sources. Even a scant bibliography can be a thing of beauty. Non-fiction and biographies of early silent film figures and 1960s-1970s era musicians, for instance, are often thin on contemporary print sources; as emerging forms, few major publications covered early silent film or rock music. The best contemporary reviews, interviews and articles about 1960s rock music were often found in music magazines and small regional papers that didn’t survive the era, and these magazines and papers are sometimes as intriguing as the biography subjects themselves. Take this Ellen Herst article about the parallels between Charles Manson and folk musician/ostensible cult leader Mel Lyman. The article, found in an online bibliography about Lyman, was taken from Boston After Dark, a precursor to The Boston Phoenix and its many offshoots. A Wikipedia entry about The Phoenix reveals the much more interesting story of The Real Paper, which was formed by displaced/disgruntled writers from The Phoenix. The bibliography can be a book’s best aspect, surpassing the quality of the writing or the subject. Such is sometimes the case with Greil Marcus’ books; while Marcus’ books themselves are wildly uneven, but almost any of his books are worth buying for the bibliographies alone. Marcus may not always pull the rabbit out of the hat, but the hat is full of tricks, any of which may be better than the rabbit itself. Bibliographies are so valuable to me that I sometimes wonder what’s missing. What did the author come across, during his research, that didn’t make it in? What information that disproves the thesis/did not seem important/was too vexing to parse is missing? What didn’t the author discover about the subject? Depending on what the reader knows about the subject, this can change the perception of the book itself radically; while researching a project about author Caroline Gordon’s Penhally, I came across two books by the same author that should have included Gordon’s fiction in a discussion of the way the Virginia Cavalier ideal shaped Southern literature. The author’s complete omission of Gordon raised troubling questions for me — did the author’s research somehow fail to turn up Gordon’s fiction, which could be the sign of poor research, or, as a male author, writing mainly about other male authors, did he simply discount Gordon’s contributions? The answer may be simpler; upon further investigation, I realized that the books were written before widespread use of the Internet, and in a period when most of Gordon’s fiction was out of print. If the Internet itself is the ultimate bibliography, it’s one without context. A Google search for “dana andrews biography” will turn up a lot of stuff and nonsense about Andrews’ most popular films and aspects of his life, but few that I explored feature any mention of Swamp Water, much less Vereen Bell or his writings. And that, ultimately, is what makes the author-created bibliographies a much better jumping-off point for learning. Instead of relying on the (questionable) intelligence of an algorithm, you rely on the dogged pursuit of an author to learn about his subject. That’s never a bad place to start. 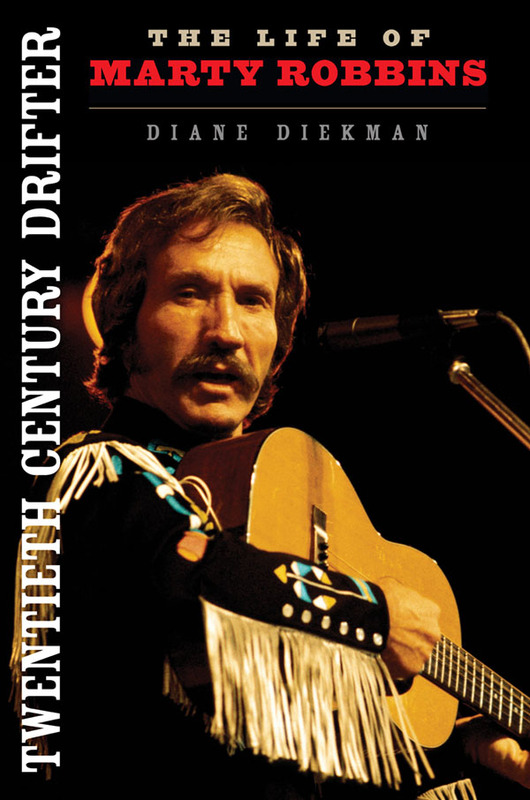 Twentieth Century Drifter: The Life of Marty Robbins is the first biography of this legendary country music artist and NASCAR driver who scored sixteen number-one hits and two Grammy awards. Yet even with fame and fortune, Marty Robbins always yearned for more. Drawing from personal interviews and in-depth research, biographer Diane Diekman explains how Robbins saw himself as a drifter, a man always searching for self-fulfillment and inner peace. Born Martin David Robinson to a hardworking mother and abusive alcoholic father, he never fully escaped from the insecurities burned into him by a poverty-stricken nomadic childhood in the Arizona desert. In 1947 he got his first gig as a singer and guitar player. Too nervous to talk, the shy young man walked onstage singing. Soon he changed his name to Marty Robbins, cultivated his magnetic stage presence, and established himself as an entertainer, songwriter, and successful NASCAR driver. For fans of Robbins, NASCAR, and classic country music, Twentieth Century Drifter: The Life of Marty Robbins is a revealing portrait of this well-loved, restless entertainer, a private man who kept those who loved him at a distance. Marty Robbins’ career and personal life seem rather tame, compared to peers like Johnny Cash or Waylon Jennings. No drug or alcohol addiction continually threaten to ruin Robbins’ career or end his life. No love-life pathos — Robbins remained married to his wife, Marizona, until his untimely death in 1982. Robbins never fell from grace with music fans, so a triumphant rediscovery is not part of his legend. But don’t make the mistake of letting a lack of high drama turn you off from Twentieth Century Drifter: The Life of Marty Robbins. Robbins was a fascinating artist in his own right, and Diane Diekman’s book does him justice. Many music biographies fall into two categories: those that read more like recording session notes, focusing almost entirely on the artist’s recorded output, and those that instead focus too tightly on the artist’s personal life. Twentieth Century Drifter strikes the perfect balance. While Diekman includes many details about the intensely private Robbins’ personal life, she also spends a lot of time on Robbins’ songwriting routines, stories behind some of his most beloved songs and his recording habits. Diekman’s attention to these details is valuable; despite being one of the most popular artists of his day, Marty Robbins is remembered today mostly for one song, his iconic “El Paso.” It’s a disservice that Diekman’s book does much to rectify, revealing Robbins as the bridge over the gap between country music’s first iconic singer-songwriter, Hank Williams, and those who came after Robbins in the late 1960s-early 1970s. The scope of Robbins’ career more than makes up for the lack of tabloid-worthy drama. In between writing and recording hundreds of songs in several genres over four decades, Robbins acted in several movies, starred in two television shows, was a regular performer on The Grand Ole Opry, and operated his own publishing companies and record label. His most famous second career, however, was that of a NASCAR racing driver. Although Robbins was never a champion driver, he logged respectable finishes on several of the circuit’s biggest tracks. Not surprisingly, the 1970s section of Diekman’s book is dominated by Robbins’ NASCAR career, something Robbins would have appreciated. Hopefully, Twentieth Century Drifter will introduce Marty Robbins to a new generation of fans while satisfying existing fans’ need to explore Robbins’ life and career. And here’s a bit of useless trivia — Marty Robbins’ most famous song, “El Paso” was frequently covered by the Grateful Dead in their live shows. In total, the band performed the song almost 400 times, which probably rivals the number of times Robbins himself played the song. This semi-biography of Don Kirshner by Rich Poldosky led me to identify a whole new genre of non-fiction: when mediocre books happen to stellar stories. 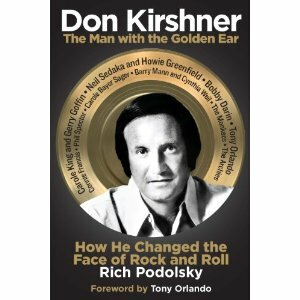 The story Poldosky tells in Don Kirshner: The Man With the Golden Ear – How He Changed the Face of Rock and Roll should, by all rights, be riveting. Don Kirshner’s role in the development of rock and roll has long been neglected; for almost thirty years, Kirshner was at the helm of some of the most interesting ventures in rock music. From his pivotal role in the Brill Building pop songwriting scene, to his early melding of music and videos with the creation of the Monkees and his long-running TV show Don Kirshner’s Rock Concert. Unfortunately, Don Kirshner: The Man With the Golden Ear only tells part of that story. As such, it’s erroneously named; a book about “how (Kirshner) changed the face of rock and roll” would spend more time with the Monkees and Don Kirshner’s Rock Concert. Instead, Poldosky focuses on Aldon Music, the publishing company Kirshner formed with Al Nevins in the late 1950s, and therefore is more about how Kirshner changed the sound of rock and roll. For anyone who enjoys rock music, the pages Poldosky devotes to the halcyon days at Aldon’s Brill Building offices are the highlight of the book, offering great insight into the way that pop music was written and marketed in the early 1960s. While Kirshner and Nevins’ song factory set-up was hardly unique, originating in Tin Pan Alley a generation before, it’s still fascinating. Poldosky describes some of the era’s most celebrated songwriters hammering away at their craft in cubicles separated with paper thin walls, writing songs on pianos. This close proximity bred fierce if friendly competition between songwriters, especially the husband/wife duos of Carole King and Gerry Goffin and Cynthia Weill and Barry Mann. This section, however, is the high point of a book that is frustratingly uneven. While Poldosky’s interviews with Gerry Goffin, Jack Keller, Kirshner and others involved with Aldon Music paint a fascinating picture of how the songwriters worked, and provide creditable veracity to the narrative, Poldosky shortchanges his own accomplishment by offering distracting — and frankly unflattering — information about all the interviews he could not get. Instead of adding a few lines at the outset of the book explaining that Carole King, Cynthia Weill and Barry Mann (among others) declined to be interviewed, Poldosky inserts long, wandering asides throughout the book explaining the circumstances of each interview he did not get, and, in many cases, those he did. It’s distracting, to say the least, and interrupts the flow of the book. Add to this numerous spelling mistakes, a final third of the book that feels rushed and incomplete, and Don Kirshner: The Man With the Golden Ear becomes a flawed, but nevertheless interesting account of one of rock music’s most influential characters.